I got this recipe from a good friend of mine Melanie, and it had no name. So, I asked my Facebook Fans to help me name it. My favorite was from Julie, hence came “Cheesy Tomato Stroganoff”. *Scroll down to use print recipe feature and add to your Recipe Box. 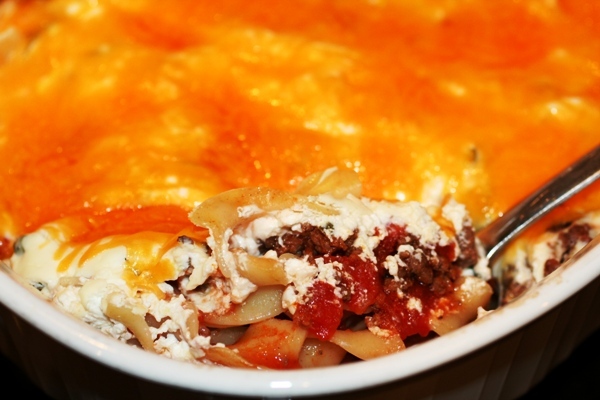 **I lightened this up by using 1/3 fat cream cheese, low fat sour cream and wheat no-egg noodles. 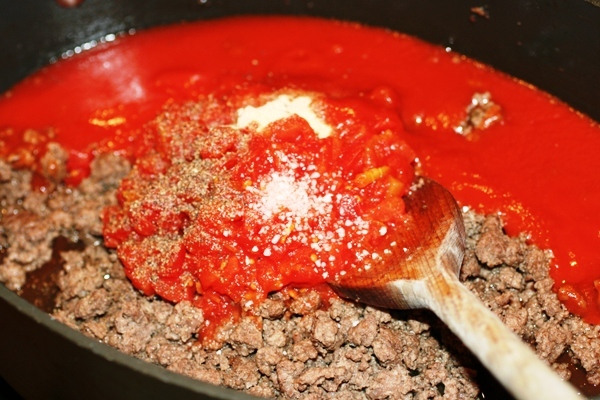 Brown ground beef and drain, then add tomato sauce, tomatoes, salt and garlic powder. 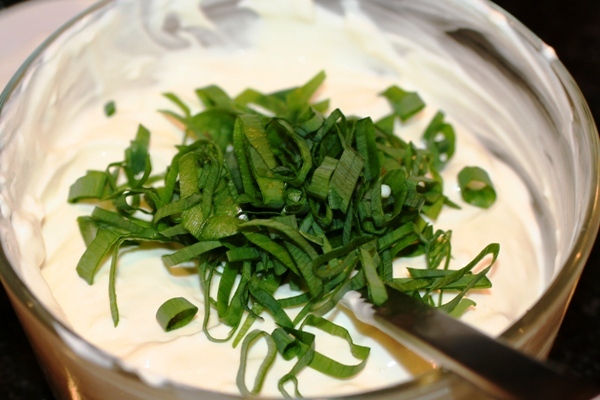 Mix cream cheese, sour cream and green onions. I microwave the cream cheese for about 30 seconds to make it easy to stir them together. 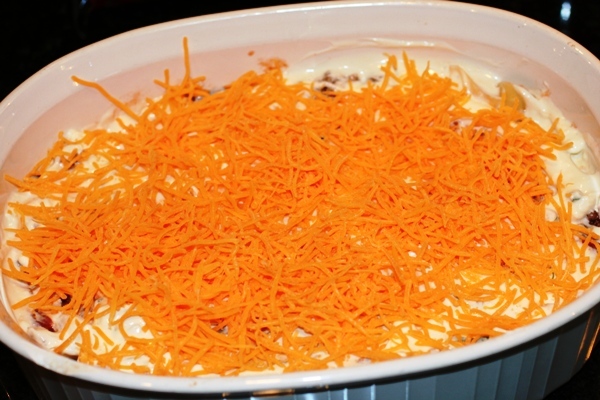 Finish with cheese mixture. Lastly, top with shredded cheddar cheese. Cook in a 350 degree oven for 20-25 minutes, or until warm and bubbly! In either one 9×13 or two 8×8 pans, layer ingredients. First, put noodles in bottom of pan. Last, top with shredded cheddar cheese. Cook in a 350 degree oven for 20-25 minutes, or until heated through and bubbly! Recipe provided by Kelly Hancock ©2010 Faithful Provisions. For personal use only. May not be reproduced, reprinted or distributed for capital gain without prior permission from Kelly Hancock. I can’t wait to try this, it looks delicious! Only question I have, and sorry if I missed it as I’m not completely awake yet, was at what temp and how long did you bake it for? Sorry, I did forget it, it is 350 degrees for 20-25 minutes! How long do you cook it and what temp? Emma – So sorry, I was half asleep while posting this! It is now in the post, but 350 degrees for 20-25 minutes! I make this all the time but with spaghetti noodles. We call it spaghetti pie. This looks good, economical, kid-and-husband-friendly, and easy! My favorites! But when I hit the “print friendly” button, it started to print multiple pages of everything but the recipe. LOL I thought “well, it’ll print it here in a second,” but then grabbed about the 4th page it had printed, and looked at the bottom of the page and here it said “12 of 15” !!!!! Whoa!! I shut it off. Maybe a Firefox issue? I’m not sure. I make this, but substitute Rotel for diced tomatos…spices it up a bit. I am so glad you posted this when you first wrote about this I commented I SO wanted to recipe. Tell your friend thanks! We had this for dinner tonight and it was GREAT!!! Made 2 batches so that I could stick one in the freezer. This would be a great meal to take to a new mommy! Thanks so much for sharing!! I have this same recipe. but instead of creamcheese I use cottage cheese. It’s one of our favorites. In my cook book it’s called Company’s Calling Casserole. I’ll have to try it with cream cheese though! I have made something similar called spaghetti pie but I just made this tonight and it was simpler and really yummy! I didn’t have sour cream so I substituted the plain homemade yogurt I made from your crockpot yogurt recipe you had here a few weeks ago (I was thrilled with that recipe too!). The cream cheese mixture was really creamy and no one knew the difference. I also added onion powder since I was a bit short on green onions. Thanks for your incredibly helpful website! I love it and tell people about it all the time. Very easy to make and delicious! I make a recipe very close to this. Egg noodles, spaghetti meat sauce, and a white cheesy mixture of. Cream cheese, sour cream and ricotta. If ricotta isn’t on sale I use cottage cheese. I layer noodles, cheese mixture, then meat sauce and repeat. 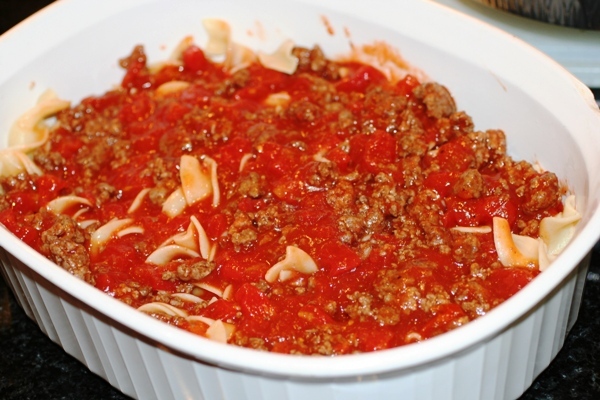 It is an suer easy lasagna casserole! Yummo with salad and bread! About how many servings do you think this makes? It was very bland. Don’t know what I did wrong. Definitely had to add salt after it was cooked. Any suggestions? 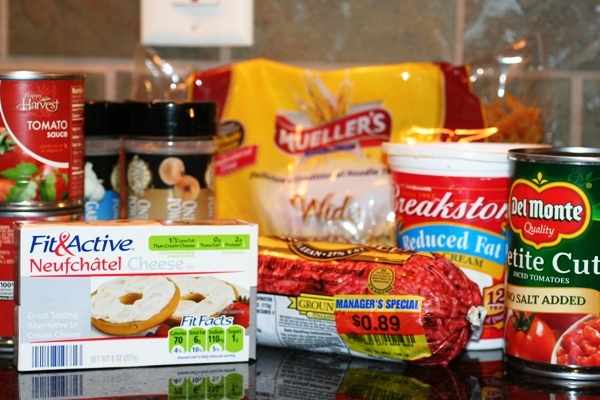 Just add more salt or garlic salt to the cream cheese and meat mixtures. That should do it! I make something similar to this…I use mozzarella cheese and parm!! Love the added green onions, I will have to try that!!! What an all round well written blog. Super yummy! I didn’t have cream cheese or tomato sauce, so I used 98% fat free cream of mushroom soup & condensed tomato soup, respectively. Thanks!! The leftovers were almost more delicious! I know this as Beef Lombardi. It’s so much easier than lasagna. Easy makes it taste better to the cook! Thanks! We enjoyed it! !